Next Gen Graphics? This is always one of the most important categories when a new portable or console launches. This is usually the wow-factor to draw people in. The 3DS definitely has the ability to render some nice looking 3D visuals, when my head was in the right spot in the middle of the screen. 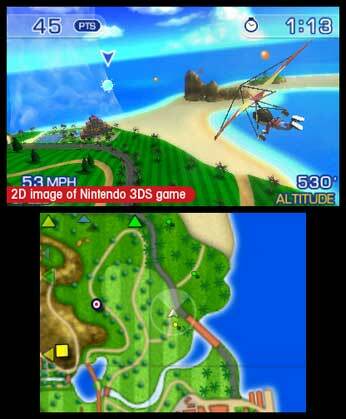 The only game I could test out was PilotWings Resort and the visual theme is basically an upgraded Wii Sports Resort and Wii Play look. Landscape textures were good for not trying to be photo-realistic. 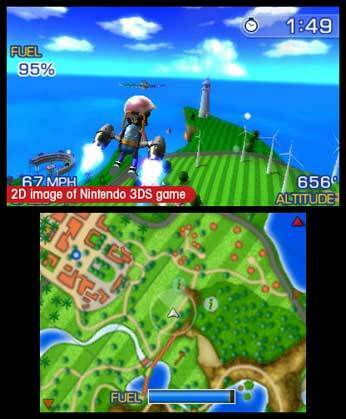 The buildings and other geometry in the game looked good but nothing dropped my jaw since that's not the goal of PilotWings. The framerate was also consistent (30 FPS+). 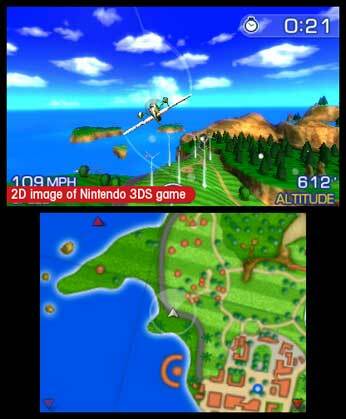 Unfortunately with only PilotWings Resort, I can't really get a good sense of the graphical capabilities. I'll assume since Hideo Kojima is making a new or ported Metal Gear Solid game and Resident Evil Mercenaries looks great, the graphics are enough to wow a new generation of portable users. 3D Graphics: As I moved the slider up to the more intense three dimension, the objects and landscape at the way back of the screen stretched further "back". I could detect an extremely brief pause or restarting of the onboard video rendering device as I switched from the minimum 3D to the off position. This statement means the game did not stutter or briefly pause, only the display for the tiniest fraction of a second did a refresh. The 3D experience was very powerful and I agree with Nintendo when it's one of those things you have to see for yourself to believe. For people wanting to experience the 3DS graphics, Nintendo is shipping out demo kiosks to chain stores. Most retailers will probably have them setup within the next week, with some Best Buys already having them operational. The plane, jetpack and hang glider all appeared to have foreground substance with the jetpack looking the best in 3D. It felt like the flames were coming out of the screen at me. The metal curve of the jetpack had very convincing shaders making the thruster portion look circular. With the 3D slider turned off, both effects were lost and the visual impact of the jetpack was much less. With no 3D on, the jetpack looked flat and boring. My favorite part about the 3D experience was as I was navigating the world, I tried my best to crash into everything I saw. There is important 3D feedback where as I dodged the side of a cliff, I could see the cliff "move" away as it would realistically in my peripheral vision almost. I decided to test out what each eye could see by using the photograph reticule while flying straight. The left eye does seem the reticule shifted to the left while the right sees the reticule shifted slightly to the right. That's the beauty of stereoscopic 3D. For those prescription glasses users out there, I had no issue seeing the 3D while wearing my glasses. I also saw the same level of 3D visuals when I took my glasses off since I am only slightly near sighted. The only downside of the 3D is your eyes may get "tired" or "annoyed" by looking at the simulated 3D for a while. I chalk it up to being more of the visual system freaking out since stereoscopic 3D technology is being used too fool an already stereoscopic visual system. I ended up playing around with all settings of the 3D slider and I would probably stay with 75% 3D effect. As mentioned by other previews, the user has to be in the sweet spot for the 3D to appear correctly. I moved my eyes to the sides of the screen and the visual effect was lost. Perhaps if I wasn't leaving the sweet spot so much, I could play games for hours with the full 3D effect. PilotWings Resort Preview: A brief summary is to take PilotWings 64, add Miis and add more levels of difficulty. I was only playing the Bronze level challenges so I wasn't able to see if the epic cannon and jump boot minigames had returned. There were multiple save slots ( about 5 or 6) which is an improvement over the 3 slot staple of current portable games. The title screen had the same intro music as the N64 PilotWings slightly changed yet still alluring. 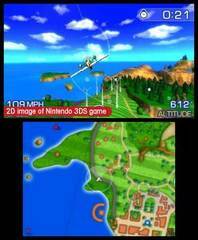 Compared to that N64 version, the vehicle speed in PilotWings Resort feels slower even though at some points I was going 50 MPH on a hang glider for instance. The game is still very point driven and you can get bonus points for picking up the floating directional pellets on your way to the next target. Instead of having to restart the mission when crashing, the game will eject your Mii from the plane and reset you back in the air. A sad downgrade is the plane's cannon no longer fires rockets, it fires spaceship pew-pew sounding blue projectiles. Photo mode is still in the game where you can take up to 6 pictures per the mission and I guess save them, hopefully to an SD or internal storage. At a retail price of $40, I personally would pass until it went down to about $30 or so since this isn't a AAA game in my book. Don't get me wrong because I love PilotWings 64 and this game is actually a really robust game for being a launch title. Just, I would prefer to buy Kid Icarus, Paper Mario or even Zelda. Ah Nintendo, you are really going to have to justify the $40 especially with the recent attack of full fledged mobile and touch gaming at sub $10 prices. Iwata, you better respect those "garage indie" developers; they are going to be a big part of your software developers when Miyamoto is no longer producing games. Buy or Not? : I'm going to WAIT for now. The 3DS at $250 is not an instant buy for me. At launch the release games are uninteresting and I'm not prepared to spend $250 for the 3DS, $40 dollars for Ocarina of Time and tax just for that one game. The 3D graphics come really close to justifying the high price yet I can't shake the feeling 75% of the time people will have the slider set to 2D where the graphics so far can't touch the PSP. Also at $250, it's more expensive than the Wii and is almost approaching the next generation console price of $300. If the money is burning a hole in your pocket, you can't go wrong with this year's future software lineup. Thanks for the writeup. Loved Pilotwings on N64 so gonna pick this one up when I buy my 3DS on monday! Looks Pretty Cool! =) But do you have to wear 3/D glasses to view the spectacular 3/D images coming at your face? 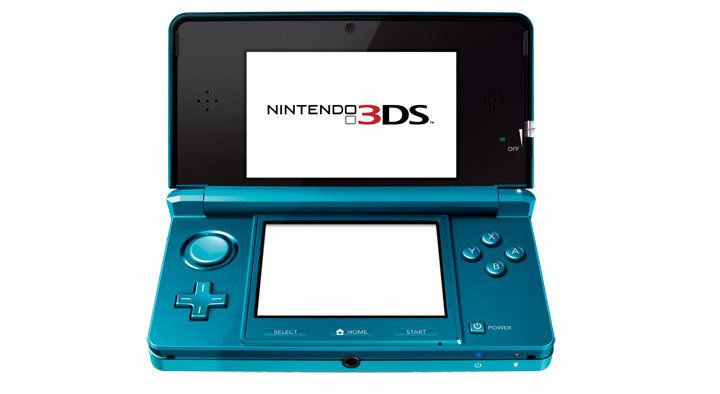 Nope, there are no glasses required to see the 3D images; that's the main feature of the Nintendo 3DS. I only mentioned glasses in regards to people who already wear normal glasses.